Live Roulette – Evolution Gaming is rightly considered to be the king of the live dealer casino gaming world. They have a surplus of games spanning all your favourite table game genres. As the leading developer of this kind of software, they don’t just offer a single live roulette game. In fact, there are over 10 different variants, each of which brings its own unique style of gameplay to the table. Of course, for budding newbies, the regular Live Roulette game from Evolution Gaming is a great place to start. It is based on European roulette, although French and American roulette variants can also be played. These games are typically streamed from Latvia, Malta and the UK. They all offer HD, mobile-friendly live dealer gameplay. Naturally, American roulette is played with a double-zero pocket. French roulette has the racetrack bets, as well as the En Prison and La Partage rules for those who are interested. While the basic rules of roulette apply to all three of those variants, there are other live roulette variants from Evolution Gaming. Which offer quite a different experience. Let’s look at some of the more popular live roulette options you have open to you. Immersive Roulette: Evolution is the only developer of this variant. The idea behind the game is that it allows players and up close and personal look at the table via HD cameras. These 200 FPS cameras allow players to immerse themselves into the thick of the action. A Lite version of the game can also be played, although it lacks the slow-motion replay action. 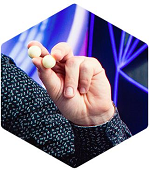 Live Double Ball Roulette: Another one of Evolution’s original games, this game sees two balls dropped at the same time. This naturally creates two winning numbers. With the added betting options available, the top prize in this game is an eye-popping 1,300:1. Mini Live Roulette: Another take on the standard European roulette game from Evolution. This game is understandably a miniature version of European roulette, though in a scaled-down window. The beauty of this game is that owing to its small size; it allows players to wager on several other games at once. Slingshot Auto Roulette: A hugely popular variant from Evolution, Slingshot Auto Roulette is available for standard players and VIPs. There is no dealer here, with an automated machine dealing with gameplay. Between 60-80 games an hour can be played, and half-currency betting is made possible with this original release. 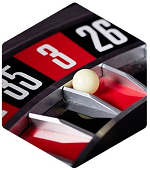 Speed Roulette: Players in a rush will fancy this roulette game. It offers gameplay which lasts just 25 seconds, almost twice as fast as usual. Speed Roulette is ideally suited for players who don’t fancy dead time and just want to get on with it. VIP Live Roulette: Again, this game is like the standard live roulette games from the developer, though with a twist. You’re not going to want to sit at this live dealer table if you’re short of funds. The game is ideally suited for players with an ample bankroll, as bets can tasty and costly. Like most live dealer casino games, Evolution’s range of roulette games are streamed from studios and land-based casinos across the globe. Their main studio is based in Riga, Latvia and that is where most of their roulette games are streamed from. Localised roulette games (multilingual titles) are generally streamed from Malta, although some games also stream from Vancouver, Canada, and London, UK. The developer also carries games out of real land-based casinos. The Casino de Spa in Belgium, and the Gran Casino Murcia in Spain are just two of the venues playing host to Evolution’s VIP live roulette games. Each roulette variant has been designed to bring the action to players in glorious high definition video. You can interact with the dealer in almost all games. Evolution also prides itself on its ability to offer mobile live dealer gameplay with most of their titles. Gameplay is not restricted to English either. There are German, Swedish, Italian, French, and Spanish (amongst others) language versions of their games available to play. The Wheel and Table: Before you can play roulette, you need to familiarise yourself with the table and roulette wheel itself. The roulette wheel will contain red and black numbered pockets, numbered between 1 and 36. There will also be a zero pocket (0) on a European roulette wheel, and two zero pockets (0 and 00) on an American roulette wheel. You should also look at the betting board. All 36 numbers are present on there, as are the various other bets you can make. Keep in mind where the numbers are, as this is important when it comes to placing your bets. The numbers are displayed in 3 columns of 12 numbers. Dozen: Betting on either the first twelve (1-12), second twelve (13-24) or third twelve (25-36) numbers. 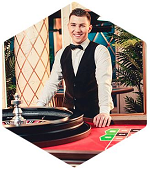 Once you have placed your stake on the relevant spot on the betting board, the croupier will drop the ball into the spinning roulette wheel. If the ball lands in a favourable pocket in relation to your wager, then you will win. If not, you will lose. If it lands in a zero pocket, you will also lose, unless you happen to be playing a French Roulette variant or have a bet on a Five-Number Bet in Live American Roulette. 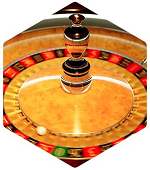 There are numerous Live Roulette variants for you to play, each with their own subtle takes on the rules, such as En Prison and La Partage in French Roulette. Similarly, additional bets via racetracks are also part and parcel of roulette variants. None of those are required for you to start playing Live Roulette right now, though. Evolution Gaming’s roulette games come in package suites. What one casino chooses to offer its users may not be the same as another. Always check the package available before you decide to sign-up at a casino site. Generally speaking, there isn’t just one live game for each variant. A casino will likely carry several different tables for each variant, and those tables will have somewhat different table limits. This enables Evolution to cater to all players, irrespective of their budget. If you’re not happy with the view, you can feel free to adjust the camera on your feed. This will enable you to get the optimal view for your game. Note though, if you wish to play with a camera right in the centre of the action, you need to play Immersive Roulette. Many top casinos which offer Evolution Gaming’s live roulette suite will also often provide unique bonuses and promotions on those games. It is always worth checking out if such offers exist at your live casino before you sit down to play. If you are after playing the best live roulette games in the business, then Evolution Gaming’s arsenal of titles is the way to go. They have something for every players’ needs and preferences. Their games can also commonly be found in virtually all major and popular online live casino sites.